Are you human or are you extraterrestrial? 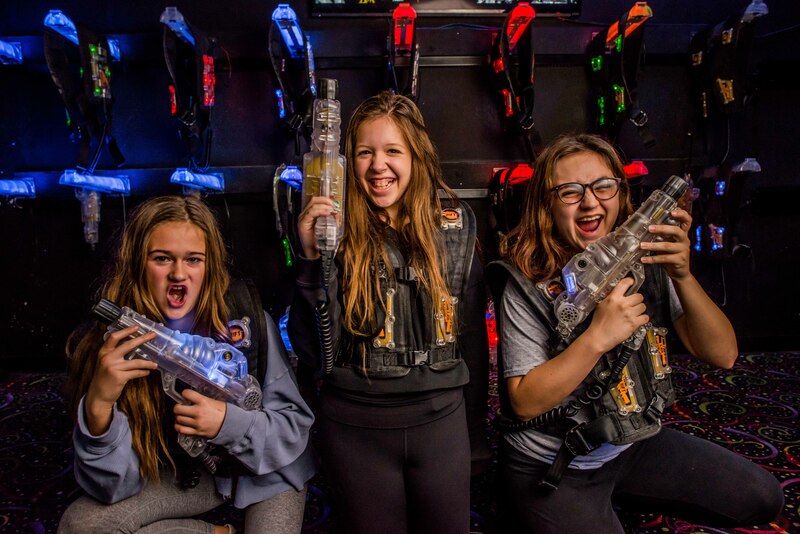 CrackerJax newest attraction Alien Invasion Laser Tag allows you to decide. Two teams with the same goal, win with the most points. To get points you deactivate other players with your laser phaser and disable their base. The arena has murals of out of this world planets and aliens, sure to catch your attention. * Hours Of Operation May Vary. Try your driving skills on CrackerJax Speedway. 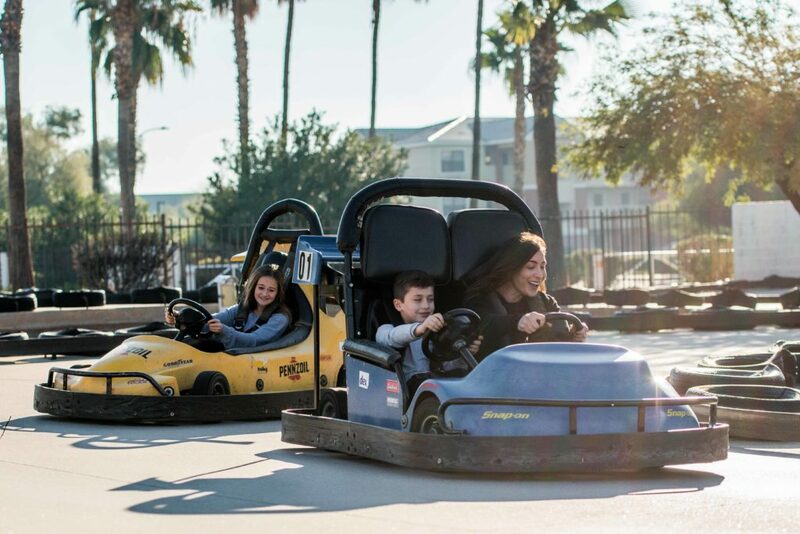 You'll drive one of our Can-Am style go-karts on Arizona's most challenging track. The course is over 1200 feet in length (the longest in Arizona) and includes hairpin curves, S-curves and a banked track. Several observation areas with seating are provided offering spectators an exciting perspective and motivation to test their own racing skills. Single and double seat cars are FUN FOR THE WHOLE FAMILY. 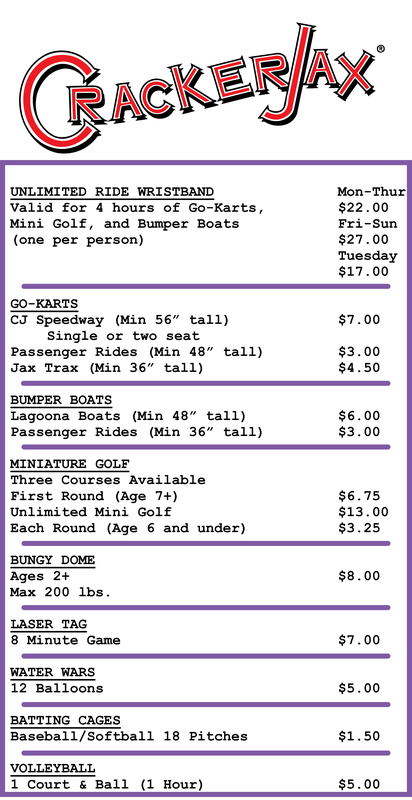 Height restriction: Driver: minimum 56" | Passenger: minimum 48"
The Jax Trax is a separate course designed for young children and uses high quality, full-bodied, Indy-style racing karts. Safe fun is imperative. 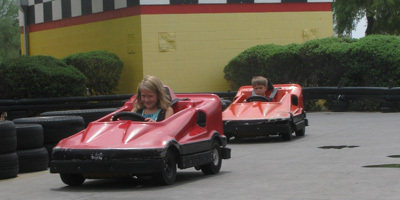 Kart safety features include a safety belt and full protective bumper rail system on karts and track perimeter. Our custom track design offers both right and left-hand turns, on a three hundred foot, level circuit with ample room to pass. 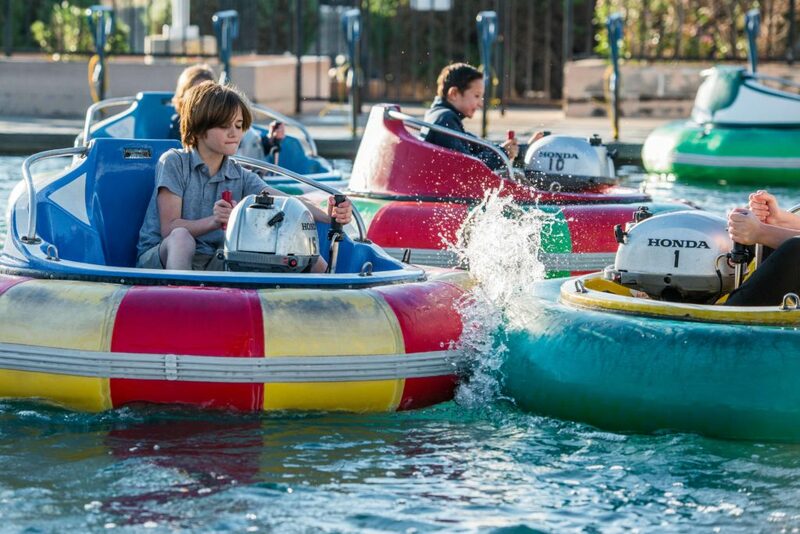 Height restriction: Height restriction: Minimum 36” Maximum 56”"
Our Bumper Boats are a GREAT way to escape the heat while you cool off under the waterfall. The lagoon is 6,000 square feet with a center island to cruise around and a refreshing, flowing waterfall, all surrounded by dense landscaping and large natural boulders. Periodic sprays of water mist originate from the island for those who stray too close. Boats offer seating for one adult and up to two children. Height restriction: Driver: min 48". Passenger: min 36"
The Bungy Dome is a high performance entertainment structure that keeps people cool and comfortable while they fly to new heights. 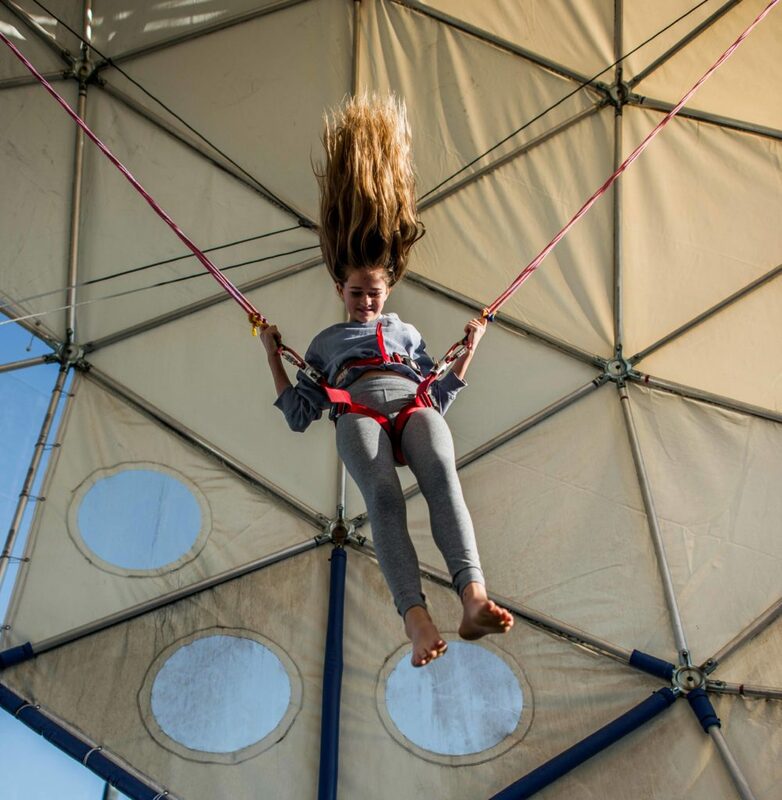 With its four Bungy stations, Bungy Dome patrons can jump up to 30 feet in the air! Bungy safety cords allow participants to complete a variety of aerobatics while remaining secure in their safety harnesses. The attraction is open day & night during regular park hours. Other restrictions: Guests who cannot jump include, but are not limited to those that are: Under the influence of drugs or alcohol, pregnant, have medical conditions that may be worsened by jumping or extreme physical activity (back, neck, heart, etc.) Guests may not use 4 Hour Wristbands, Family Five Packs or Family Ten Packs. The ride lasts up to 5 minutes of jumping per person. Designed with the teenagers and adults in mind. The holes are challenging with greater putting distances. On this course, things are not what they seem. Putt across a diving board into a backyard swimming pool...or is it? A black and white checkerboard of high and low illusion...read it right and you're in the cup, wrong and try again. It's tricky. It's unique. 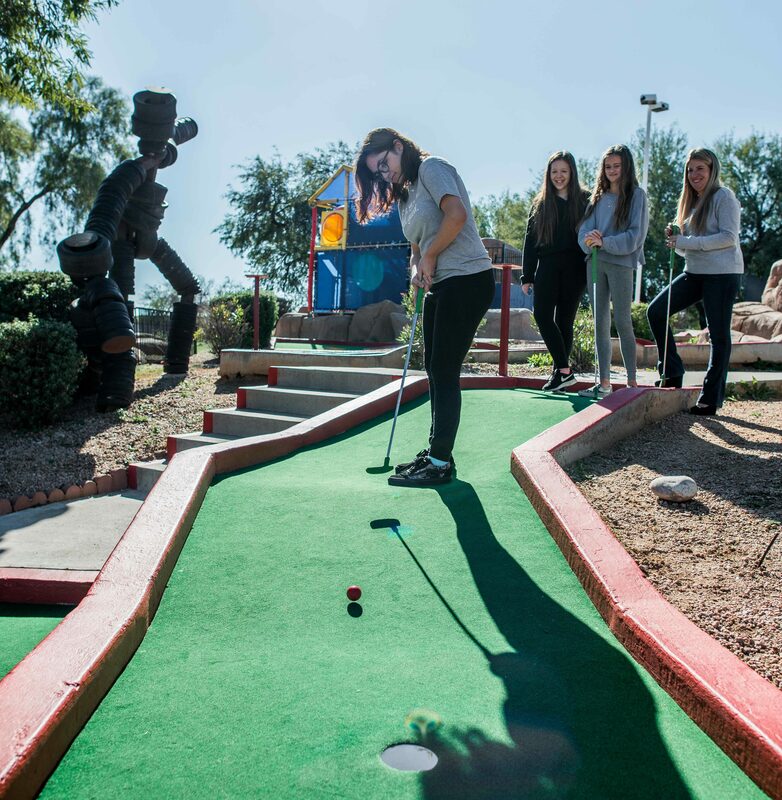 The course blends many artistic elements in a most unusual way providing a truly enjoyable experience for the most demanding miniature golfer. Both this course and our "AMaze'N Golf" course have beautiful natural settings integrating lavish landscaping and unique natural desert boulders. Age restriction: Our shortest putter is made to fit most 3-year-olds. This course is designed with the younger family members in mind. 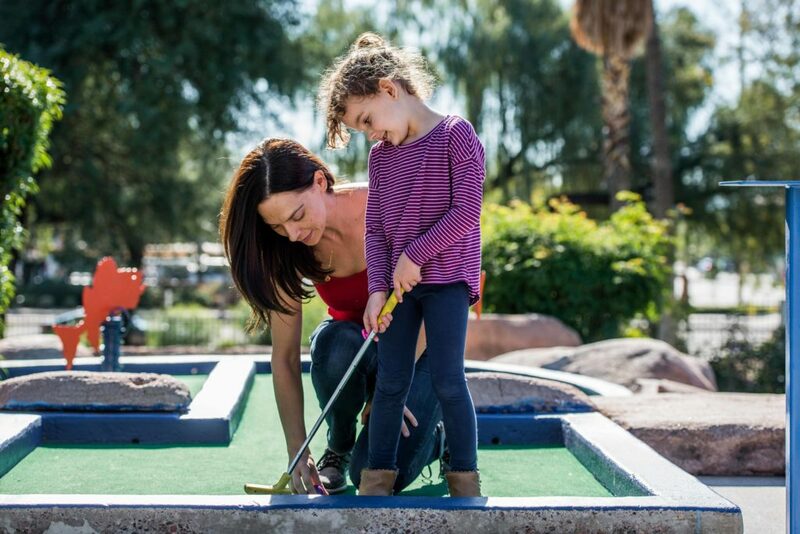 Each hole offers a distinct and interesting format from the viewpoint of a 4 to 10-year-old and is designed to be played as a joint activity with parents, grandparents, and caretakers. No putt is over twenty feet and most holes have a hole-in-one potential. Several holes integrate interactive play elements including mazes, slides, bells, and tunnels. When your ball drops to a lower level on a two or three level hole, why take the path? Just take a "tube slide shortcut" to continue play! These non-traditional features are designed to captivate and hold the attention of young children, while providing a sporting success for young children who can say, "I did it!" Opponents go to opposing battle stations with buckets of water balloons. Each battle station has a water balloon launcher. Place a balloon in the launcher, pull down on the handle, aim, and fire! Your balloon soars high through the air and comes crashing down on your opponent's battle station. There are strategically placed slots and holes in the structure that allows the water to come through. You might get sprinkled, sprayed, or saturated, but watch out, retaliation comes quickly....! Eight well-lit, separate batting cage bays offer slow pitch and fast pitch softball and baseball configured for ball speeds of 35-75 mph. 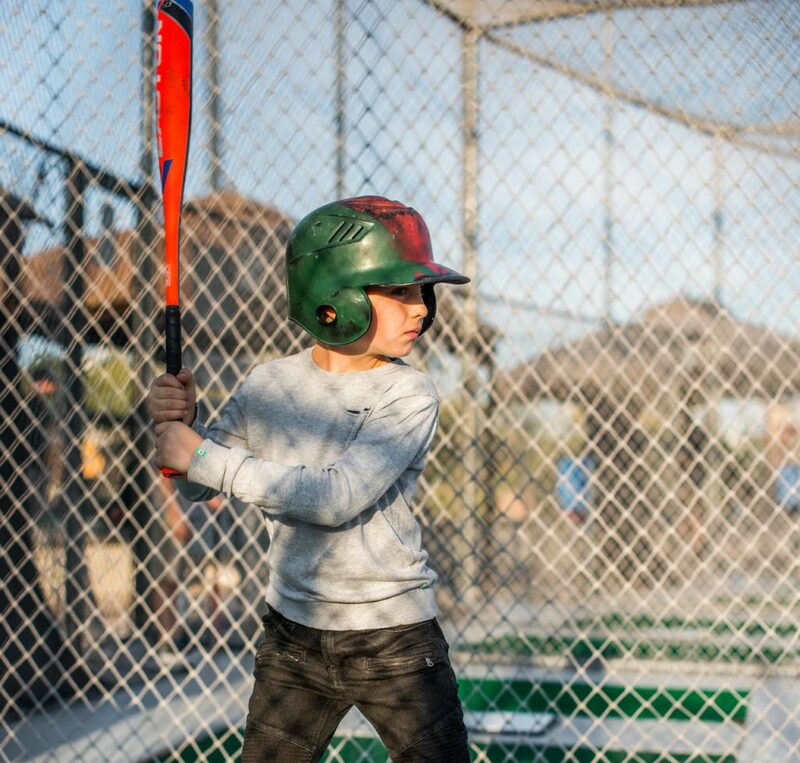 Each batting cage has a swing arm release to help the batter time the ball better. Cages are utilized on a first come first serve basis only. At Cyber City, you will find the most popular video and prize redemption games. Test your skill on the hottest games in town! Win tickets for the best prizes with interactive games for all ages. 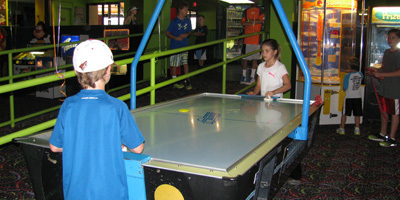 Enjoy indoor simulation games, skee-ball, and kiddie games. The main clubhouse also houses the redemption counter, stocked full of the latest prizes! Just swap your tickets for your favorite prize. Centrally located in the park, three tournament style volleyball courts have been incorporated using a natural sand base. Ace Alley was designed for both day and night play and are offered to CrackerJax visitors with a ball rental by the hour. City volleyball leagues and Professional Volleyball Association exhibitions and tournaments can be seen at Ace Alley. Additionally, you will find grass berm knolls surrounding the courts which serve as natural grandstands for spectators. Sand Court & Ball: $5.00 +tax Per Court, Per Hour.